This pdf is 41 pages long, 1 page front cover, 1 page editorial, 1 page SRD, 2 pages advertisement. That leaves 37 pages of content. 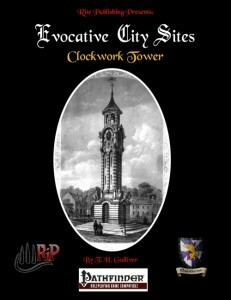 The makeup of the clock tower containing separate, beautiful maps for each of the 4 floors takes up 7 pages and starts with a nice in-character introduction that runs, intermixed with some mechanics, throughout the whole chapter, making this a very enjoyable read, especially if you’re into the central topic of this installment of ECS: Time and a clock tower moving backwards through it. There are also several cool ideas to set the mood of the clock tower, including tables for random time events in RP and in combat. The description also includes a whopping 5 boxes of secrets and 6 adventure hooks. We also get 3 new NPCs, a new magic item as well as a new kind of monster. (5 pages) While the statblocks are complex, they are not as extremely complex as some others from the ECS series – the characters are still extremely cool and I liked them all. The pdf closes with 26 pages of blown-up maps for use with miniatures. It should be noted, that map keys, the bane of my existence as a DM, have mercifully been both left out and are not necessary due to the high quality and nice drawings of the maps. The pdf also comes with 4 files à 6 pages containing the maps in scale for miniatures in A4 format for Europeans like yours truly. I’m a sucker for time travel, time paradox, chronomancy etc. – problem is, most publication, be them novels, games or movies are doing it wrong, big time. This one does it Rite. (Hitting myself for the bad pun right now…Ouch!) Both the fluff and the crunch are cool, the maps are up to RiP’s high quality standards and editing and formating are quite good – the only glitch I noticed was that in the bookmarks you can see question marks instead of hyphens. I also liked the NPCs, albeit I would have loved to see something more complex done with the final one. So, what’s my final verdict? For the very low price, you get an excellent installment of the series. Personally, the chronomancy-aspect weighs up with my minor points of criticism, resulting in a five star file + seal of approval. If you’re not that into time travel and its concepts, detract half a star.